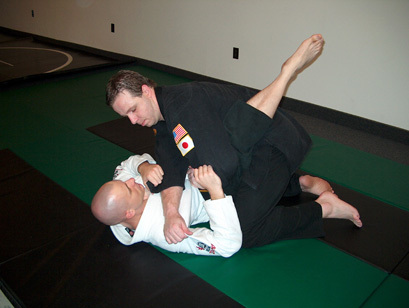 BRAZILIAN JIU-JITSU - FLOWER SWEEP: This is a transition from the guard to the mount. This is an excellent sweep to learn. 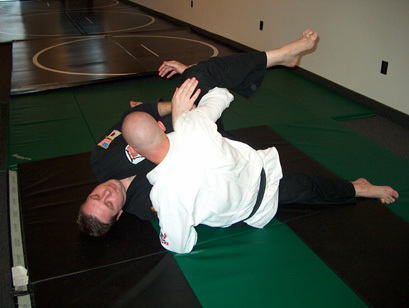 As your opponent sits with proper posturing in your guard, begin to pull them forward with your legs. Pull their right arm across with your left arm, and begin to slip your right arm under their left leg. Position your right leg to move over your opponent's back in the direction of the sweep. Send your left leg out to increase some energy for the sweep, and as you pull with your right arm, and right leg, sweep with your left leg as well. Once you roll over your opponent, you will be on the mount. This is a very good position to be in for any confrontation or match.